Now you know how to stand up on your board, what next? You need to know how to paddle!!! 1. Bury your paddle deep! Get your blade fully submerged in the water with each stroke to achieve the most amount of catch. This will provide you with more acceleration and assist with your overall stability on the board. 2. Get some power behind your stroke! 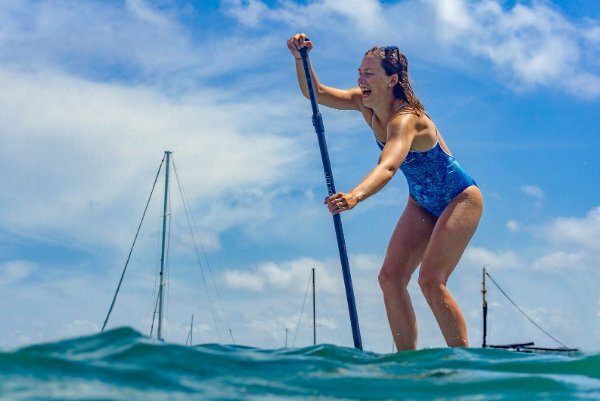 Lean forward and hinge from the hips using your body weight to push the paddle down into the water (imagine you’re using the blade of the paddle to spear a fish!) As you and your board glide towards your paddle, begin to stand upright; once your paddle is in line with yor feet, lift your blade out of the water. 3. Relax your arms! Don’t use your arms to pull the paddle towards you! If you are using your arms to power your stroke, you’re using a lot of energy for not a lot of gain! Tip – keep a soft grip and don’t squeeze your hands on your paddle to avoid over straining your forearms – remember it’s a core workout not just an arm workout! Do you want to master these techniques on the water? Book in for a lesson with one of our awesome instructors and you will be gliding through the water like a pro in no time! For our total undivided love and attention we suggest a private one-to-one session, OR if you would prefer to bring a SUP buddy – opt for a Semi-Private Lesson! No SUP buddies YET? Our open group lessons allow you to learn and have fun alongside other like-minded paddlers. Whichever way you prefer to master the art of SUP we look forward to seeing you out on the water!